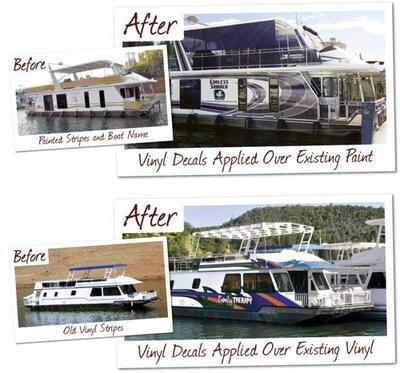 Today we are looking at ways on how to spruce up a houseboat by applying custom boat wraps, decals, striping, vinyl stickers, and boat lettering. Is your houseboat exterior getting that tired look, starting to show it's age, or just a plain bland style? You can easily increase the value and modernize the boat's exterior by remodeling or upgrading with customized boat graphics, wraps, and decals. Whether this is a new boat graphic or replaces an existing graphic, you are going to get the highest quality 3M marine graphics available from many suppliers. While the graphics industry has matured over the past decade, and has risen to the top with their expertise, creative thinking and approach. Simply stated, many of these vinyl graphics manufacturers have the credibility to service all of your graphic needs and many will guarantee your satisfaction. This means they can handle the whole job from start to finish, and they'll be there if you need follow up support. Graphics, Houseboat Wraps, Houseboat Name are all common terms. Graphics is a general term that describes this product. More specifically, Vinyl Graphics, Vinyl Decals, Custom Vinyl Graphics, Vinyl Boat Graphics, Vinyl Boat Decals, Fleet Graphics, Vinyl Stickers, Boat Lettering, Registration Numbers, Boat Names, Boat Decals, Power Boat Graphics, Custom Digital Boat Murals, Boat Stripes, and Hailing Port Graphics all represent and relate to our marine graphics. Before marine graphics, the closest thing was paint. The graphic materials they use are common place in commercial graphic applications but are just now starting to make their way into the marine graphics industry. Now is a great time to start planning and creating your new houseboat look. Lastly, hopefully some of our readers and visitors will share and post comments about their houseboat graphics experiences and tips. If you're still looking for more information, you can try our search box, found at the top right hand corner. You can also contact us to ask your pressing houseboat questions.